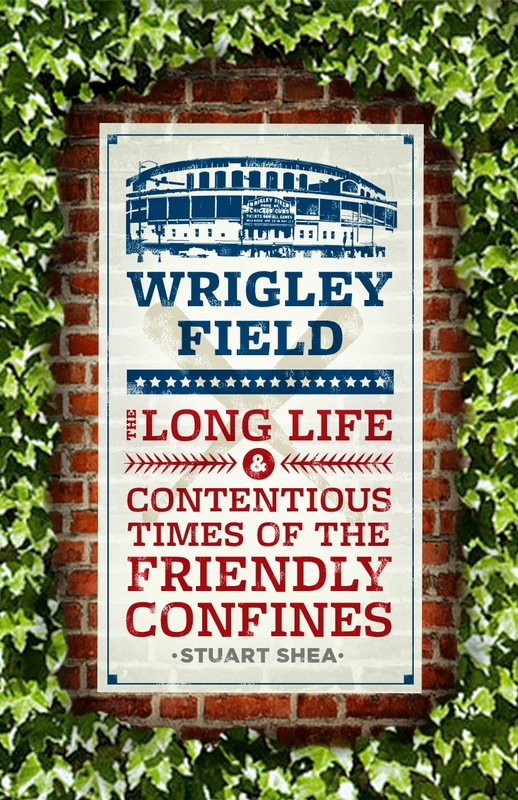 Stuart Shea is the author of Wrigley Field: The Long Life and Contentious Times of the Friendly Confines, published by University of Chicago Press in spring 2014, as well as of Fab Four FAQ (with Rob Rodriguez) and Pink Floyd FAQ. He has edited five baseball annuals and is assistant editor of Who’s Who in Baseball. Stuart and I both contributed pieces to the book “Cubbie Blues”, which is when I got to know him. The Cubs have employed plenty of heroes both long ago (Banks, Williams, Jenkins, Brown, Chance, Santo, Hartnett, Dawson) and in the recent past (Sandberg, Grace, Wood). But considering this team’s storied but often unsatisfying history, we’d like to forget that some guys ever wore the pinstripes. For every Billy Herman, Stan Hack, or Greg Maddux, there’s a Jeff Kunkel, Anthony Young, or Andrew Lorraine. Or two. Some fans would like to forget Sammy Sosa’s tenure, which produced more than 500 home runs in Cubs garb but ended in dissension, bat-corking, and suspicions of PED use. But that’s a point still to be argued. Among the ten Cubs to forget on this list, it would be hard to find a defender for any of them. All of them were bad players—at least by the time they got to Wrigley—and some were also malcontents, malingerers, clubhouse cancers, or simply incapable of handling the pressure of the major leagues. Jeff Blauser: Following a huge season for the Atlanta Braves in 1990, in which he hit .308 with 17 home runs and 70 walks (numbers well above his career norms), the 32-year-old Blauser came to Chicago on a two-year, $8M contract. Unfortunately, he stunk up Wrigley Field for the entire run of his deal. Troubled by nagging injuries, he not only hit .226/.343/.342, but also established a reputation as a clubhouse problem. His playing career ended with the last paycheck he drew from the Cubs. Milton Bradley: The talented but troubled Bradley hit—and wore out his welcome—everywhere he played. Whether arguing with fans, fighting with other players, or getting into trouble off the field, Bradley was expert at being in the wrong place doing the wrong thing at the wrong time. After a superb 2008 with the Rangers, Chicago GM Jim Hendry inked Bradley for three years at $30M. Sadly, Bradley exited the gate poorly and never got the fans on his side. Benched by manager Lou Piniella, on September 20 he was suspended for detrimental comments about the organization. Bradley did well at Wrigley Field but hit just .214 on the road with three homers. That winter, the Cubs unloaded him to Seattle for pitcher Carlos Silva, who was coming a 4-15, 6.46 season—a classic “you take my problem, I’ll take yours” swap. At least the Cubs won that deal. Ernie Broglio: It’s an awful fate to be remembered as a punch line. Ernie Broglio was a good pitcher for St. Louis; in 1960 he was 21-9 and in 1963 went 18-8 with a 2.99 ERA. But he struggled early in 1964, and the Redbirds were happy to pack him off to Chicago in a ¬six-player June 15 deal that netted young outfielder Lou Brock. While the Cubs thought they were getting a top starting pitcher, by 1964 the 28-year-old Broglio had already thrown more than 1,900 professional innings—and as a guy who walked and struck out a lot of men, those innings weren’t easy. Almost immediately he began to struggle with a sore elbow, losing bite of his curve and MPH off his fastball. Elbow surgery late in 1964 didn’t help, and he went 3-12 in 1965 and 1966, his last action in the majors. And Brock? He had a decent enough career in St. Louis. Todd Hundley: Fans who remembered the grit and smarts of catcher Randy Hundley could have been forgiven for feeling optimistic when the team signed his son Todd after the 2000 season, in which he’d hit .281 with 24 homers in Los Angeles. But Todd, raised in suburban Palatine, never turned on the jets in Chicago. Amid talk of personal and health problems, Hundley hit .187 and .211 in 2001–02 with the Cubs, showing only occasional power and playing defense that reminded nobody of his father. He last played in 2003, and in 2007 was cited in the Mitchell report as a suspected user of performance-enhancing drugs. Howard Johnson: “Hojo” had suffered through three straight bad seasons before the Cubs brought him on board as a free agent in 1995; even playing in the heady air of Colorado hadn’t inflated Johnson’s batting line. For some reason the Cubs tried him anyway, signing him for $325,000 on April 13 once the strike had ended. Unfortunately Johnson’s bat was permanently warped, as he hit just .195 in 87 games with seven homers overall (just .098 with one home run on the road). Johnson wasn’t any help on defense either, and Wrigley was his final stop. Neifi Perez: While Perez did inject the Cubs’ lineup with some attitude and hustle, he was a terrible player. Acquired from the Giants in mid-2004, the already well-traveled Perez hit .371 over 62 at-bats the rest of the way, therefore endearing him to manager Dusty Baker and GM Jim Hendry. Perez, who hit a lot of singles but did nothing else well with a bat, compiled .681 and .610 OPS in 2005 and 2006 before the Detroit Tigers acquired him. Once departed from Chicago, he was cited for repeat violations of rules against amphetamine use, which explains a lot. This guy, with his .297 lifetime on-base percentage, made more than $20 million playing baseball. Ruben Quevedo: Supposedly a mound prospect, Quevedo came to the Cubs in a July 31, 1999 deal sending Jose Hernandez and Terry Mulholland to the Braves. At age 21, he began the following season in Chicago’s bullpen, headed back to Triple-A to get in more innings, and was recalled for good in late July. He made 15 starts for the Cubs, only six of which rated as “quality starts.” His 3-10 record and 7.47 ERA made him palatable only to Milwaukee, who acquired him the next season in a minor league deal. Was Quevedo rushed by a Chicago front office desperate to prove its spurs? Certainly. Was he good after he left the Cubs? No. Ken Reitz: As a regular for the Cardinals in the 1970s, Reitz played every day, made one All-Star team, and in 1977 hit 17 homers. He was highly overrated because of his batting average and fielding percentage. Reitz hit around .260-.270 and fielded most chances cleanly…but had little pop, never walked, ran like he was stuck in a tar pit, and had poor range, meaning he didn’t get to many balls to begin with. After assembling a typical season in 1980 (.270/.300/.379), the 29-year-old Reitz was unloaded on the Cubs, with Leon Durham and Tye Waller, to obtain Bruce Sutter. While Durham enjoyed a few fine seasons with Chicago, Reitz—who was supposed to plug the team’s third-base hole—instead batted .215 with two homers in 1981; over a string of 38 games he drew just two bases on balls. The Cubs released him the following spring. Steve Swisher: This okay-field, no-hit catcher was actually the Cubs’ all-star representative in 1976, which should tell you something about the Cubs in 1976. Swisher was the White Sox’ first-round draftee in 1972 but was packed off to the north side the next winter in the Ron Santo deal. Even in the minors he barely hit his weight, and after four seasons (1974–77) the Cubs sent him and Jerry Morales to the Cardinals for Heity Cruz and Dave Rader. While he had a strong arm and was a gamer, Swisher just could not plug the holes in his swing or curb his frequent defensive mistakes. Don Young: A speedy outfielder with a light bat, the 19-year-old Young made his big-league debut on September 9, 1965—the day Sandy Koufax fired a perfect game. Following his 2-for-35 stint that year, Young didn’t appear again in the majors until 1969, when he surprisingly won the Cubs’ center field job in spring training. While he didn’t hit, his glove kept him around—at least until July 8, when he misplayed two balls in a critical loss at New York. Teammate Ron Santo, always emotional, called Young out for his miscues, and some fans piled on. By September, stuck around .230, Young was forgotten, appearing in just seven games during the team’s month-long swan dive. He never made another major league roster and was out of baseball by 1972. If the Cubs had kept Adolpho Phillips around we might never have heard of Don Young. As for forgettable players, lets add Rick Aguilera to the list. After some good seasons he came over in 1999 to be the closer and …. well you know.